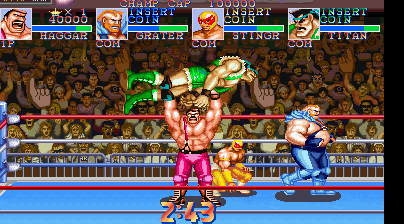 Muscle Bomber Duo is an updated version of Saturday Night Slam Masters, released in 1993. 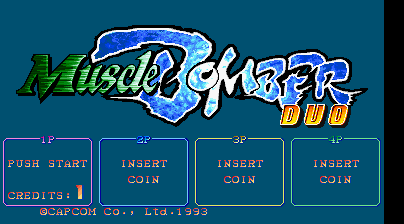 The game was released in America, but the American version still uses the Japanese Muscle Bomber title. 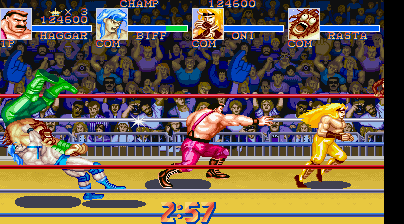 Duo now focuses on the four player mode, which was the most popular aspect of the original. Even if playing alone, you will be paired up with a CPU ally and take on a CPU controlled team. 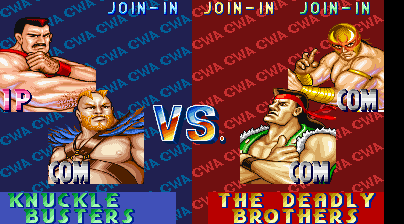 Other changes include the two boss characters being made playable, some new moves and new costume colors. One of the main complaints I had with the original was also fixed: throwing. Instead of walking into your opponent, there is now a dedicated button for throws. You can also now block by holding down the attack button.